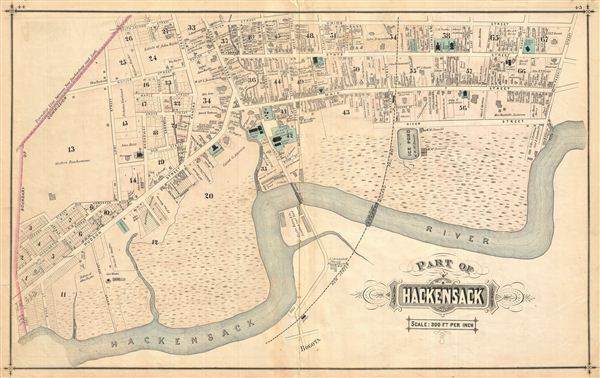 Very detailed map of part of Hackensack (1 of 2), New Jersey, showing property boundaries, owners' names and individual building footprints. Published as plates 44-45 in Walker & Pease's exquisite topographical, illustrated, historical, descriptive Atlas of Bergen County, New Jersey, 1876. Verso contains beautifully rendered lithographic views of the Bank of Bergen County, First National Bank, and a private residence, all enlivened with children playing, horses and carriages in motion, ladies walking, gentlemen talking, dogs running. Good. Even overall toning. Original centerfold exhibits some wear and in verso reinforcement. Minor discolorations here and there. Edge wear mostly confined to margins.